Improper cuts can result in bald patches on your Pomeranian. Pomeranians have beautiful coats that their owners often cut -- but what many owners don't realize is there can be risks when cutting the hair of a Pom too short. Understand that, while cutting the hair may be more convenient, it can be dangerous to your pet's health. Pomeranian owners often choose to clip their pet's hair because it's easier to care for. A Pomeranian’s hair can easily mat, making grooming more difficult. The long hair can also become filled with debris, such as burrs. Some owners also love the look of shorter hair on their pet. In the summertime, it's also natural to assume your pet needs to be clipped in order to stay cool, but that may not be accurate. There are two styles that are most common with the Pomeranian breed: the lion and the teddy bear. Other owners simply choose to clip the hair shorter with no style in mind. If you want to cut your pet's hair, you need to find a groomer or risk problems that can occur with clipping a Pomeranian's hair. Not only can cutting your pet's hair short during the winter cause problems with keeping him warm, cutting the hair too short can also prevent your Pom from staying cool in the summer. 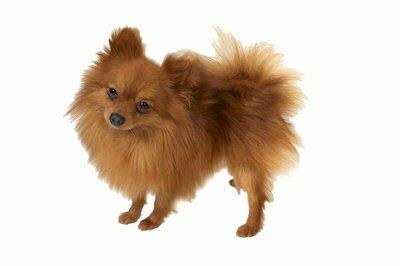 Another risk you take is that when a Pom's hair grows back it may be fuzzier, with a wiry texture. In some cases, the coat may never grow back correctly. In the worst cases, the dog may acquire a condition called clip alopecia. If your Pom has this condition, his hair may not grow back after a close shave or clip because the follicles have been damaged. Take the time to find a certified groomer to clip your Pomeranian. This ensures your dog is clipped properly and avoids many of the problems listed above. The groomer should have years of experience in grooming, especially in grooming Poms. The facility should be clean and the pets being groomed should seem relaxed. Read reviews to find a groomer who does the best jobs with Pomeranians and dogs in general.